Clear acrylic won't block your brochures' artwork. Universal bracket will mount to most slatwall panels. 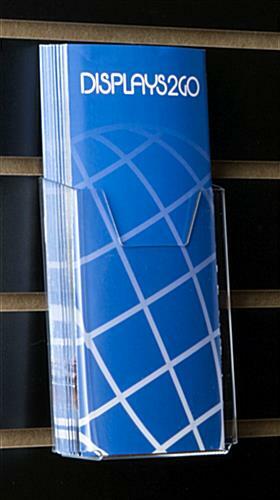 Slat wall Accessory - This single pocket slat wall accessory is perfect to hold your brochures. 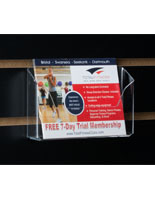 This product is a 4.125" wide pocket that is able to hold any standard 4" by 9" brochures. 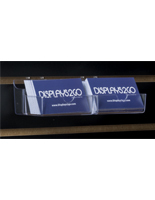 The overall dimensions are 4.125"w x 6"h x 1.25"d. It is made from clear acrylic so you are able to read the entire front of your brochure that you are displaying. 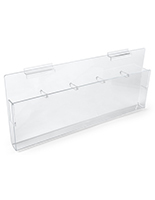 It can be attached directly to most slatwall panels without any addition mounting hardware. 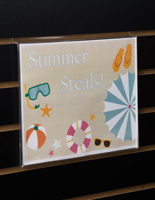 This product is a great way to inform your customer. 4.1" x 6.0" x 1.1"
The brochure pockets are the most crystal clear pockets I have ever seen. Beautiful on the slat wall and brochures fit perfectly. I did have to ask for one replacement because it came broken. It was nice not to have to mess with returning the broken one and the replacement came within the week. I think the shipping packing could be better. The box was not damaged on the outside. So, I think the items were just too free to move and bang around on the inside of the too large of box. Tamera, thank you so much for taking the time to write this review! 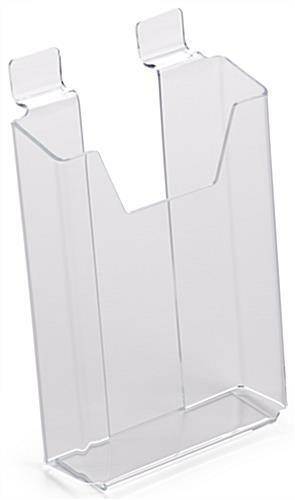 We're so happy that our acrylic brochure pockets exceeded your expectations, but we sincerely apologize that one unit arrived damaged. 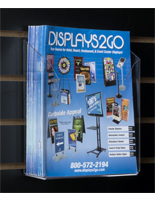 We appreciate your patience and understanding as our team provided a replacement, and we hope you can continue to count on Displays2go for slatwall accessories and other display needs. Thanks for another great review, Michele! 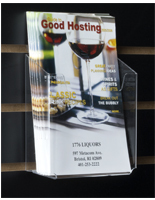 The slatwall brochure holders were received quickly and as ordered. 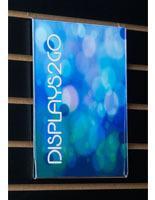 We have placed several orders with Displays2go and are very pleased with their products and service. I recently ordered from Barr Displays, who I had previously used, but received a different product than ordered and am currently fighting them for credit. 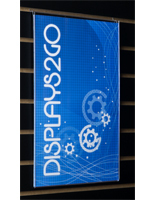 My go-to now is Displays2go. Thanks for the great review, George! We're excited to work together again in the future! The brochure pocket for slatwall is great. They arrived in perfect condition, thanks to works great, lays flat against the slatwall, holds the brochures perfectly. Would not hesitate buying again .